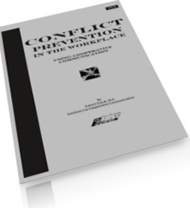 Learn To Control Conflict At Work And Home - Don't Let It Control You! Stop Harming Your Relationship With Your "Big Mouth"
101 phrases you should never use with someone you care about, and what to say instead. Click the image to learn more from the Amazon page. 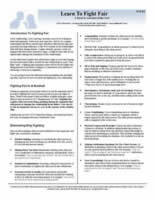 Check out our mini-guide on how to fight fair, and stop letting badly handled conflict cause pain in your relationships. Download it NOW! Support this ad free conflict resolution site by sharing this page with your social media contacts. That helps us help you. Do You Teach Others About Interpersonal Communication, Or Coach and Counsel? The low price of this book, plus the fact that it can be used modularly makes it ideal as material for use in interpersonal communication courses, or in coaching and counselling, if you are comfortable with the material. Again, we can offer bulk discounts for multiple copies. Not only does this book identify and explain why many common phrases tend to cause conflict that is unnecessary, but it explains how to say what needs to be said in a better, non-confrontational way. It's different. Practical, with just enough theory to make it valuable. Surprised When You Get Angry Responses To Something You Said? It happens a lot. You say something and your wife, or family member, or even colleague at work reacts with hurt feelings or with anger. And you're just plain surprised. We build relationships with others through our words and deeds, and it's easy to forget that the actual words we use make a huge difference in how we are seen, and the reactions we get. The trouble is that common phrases and words -- things we are used to saying every day can result in unpleasant reactions. Of course, tone of voice counts, but so do the words. We call the words and phrases that kill relationship, Imperfect Phrases. We've identified 101 phrases that you should never use with someone important to you, or else you'll suffer the consequences. Fortunately, with a little guidance, you can identify the problematic communication that you might use. That's the first step. The second step is to replace those "bad" ways of saying things, with "good" ways of saying similar things, so that the person you are speaking to is less likely to strike back in anger, or have hurt feelings. In our book, we present you with the 101 relationship killer words, so you can focus on eliminating them, AND, for each of them, we provide you with much more constructive alternatives. Rather than explain the book to you, we've made it available FREE online, so you can read it without charge, and get a feel for whether it's valuable to you. Think of it as a free book preview. 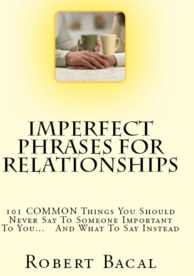 Click here to read ImPerfect Phrases For Relationships: 101 COMMON Things You Should Never Say To Someone Important To You... And What To Say Instead free of charge. Established in 1992, Bacal & Associates is a small training, consulting and publishing company with a core business centering around all aspects of communication, including helping deal effectively with conflict, dealing with difficult people, and dealing with hostile customers. For teachers, educational administrators and parents, but particularly for educators often in conflict with parents. Our main site with over 400 articles on life in the workplace. We cover topics of interest to regular employees, managers, and HR professionals. Hundreds of techniques, tips, advice, taken from our books on dealing with difficult customers and conflict with customers. We believe in a lean, information packed user experience. We limit the use of graphics and stress quality content. We also believe in a NO HYPE environment. Our product and service descriptions are free of overblown claims, and selling. Copyright © 2000 - 2016 Robert Bacal. All Rights Reserved.